Isn’t it a wonderful idea to generate electricity using the wind energy created by moving cars. 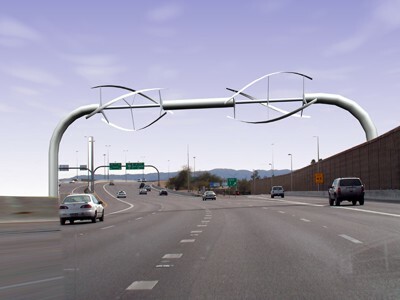 In the year 2006 some students from Arizona University designed this wonderful wind turbine to harness power from highways. And Highway Wind Turbines are now a hot area for research. As you can see from the picture they have specially designed weightless blades which will rotate the rotor from the wind generated by vehicles passing by. It is estimated that these windmills can generate 9,600kWh per year. Though it is hardly a substitute for huge power plants it has its own place in energy production. An alternative design is to use vertical turbines in the middle of the highways. Watch the video below. This design sound more promising than the former one as it can capture more wind power. These designs may have some practical limitations. But again a highway wind turbine design is a cool mechanical engineering project. This is something you can do and since this is something new (though it was designed 5 years ago you can further optimize it) it will give you more credit than a usual project. A study along with working model will do the job. Give some mechanical design projects like this for my final year mechanical project. Hiii sir….I am so interested in this project.I have given some ppts regarding this project but I didn’t get full information regarding this project so if u provide me some more information regarding this project it may help me in competing theriotical part and can start project model. Please send me the details of this interesting project. Thank you. The project looks promising and is indeed an incredible work. I would be grateful if some information regarding its construction or approach to make it could be shared. i am much interested in this project and i wish to do for ME project so pls send me details of this projects. Please send me this project details on my email-id. I want to work on this project so can you please send me information regarding your project. Sir i need the full details of this project..
sir this is wander full topic i want to work on this topic kindly requested to send me the detailed on this project. sir that’s a wonderful project and I would like to work on this project so plz send me a detail about this project on my mail. which material is used in this blades??? sir, please send me details about this project. plz send me all details about this project b’coz i want work on it.i want it in very short time..plz send me mail sir. can i ge any type of more information about this project!! i really need this…please send full details of this project. Please send me the details of this project i am very interested.I am in my final year and looking for a project in design of wind turbines.And on a slightly different note please can send me a link or anything, of a book. i want to design a vertical axis darrieus turbine but am not finding any book.I know the basics but i need much more than just the basics. I want a book that gives me the complete design so that i can design my own turbine.Please respond. please send full details of this project.this is very useful. Morning sir. Am a final year studznt, based in the republic of Cameroon. Its a cracker..please I wanted more details. This is very practical project ,so I wana work on this project…. So Plz send More details. please send me the details of this project. pls send me details about this project.